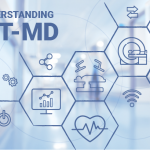 The medical device community has coined the interchangeable terms IoT-MD (Internet of Things for Medical Devices), IoT Medical Devices, and IoMT (Internet of Medical Things). Standard communication and computing devices, such as laptops and phones, have been Internet-connected for years. IoT refers to all other devices, or “things” – TVs, thermostats, cars, refrigerators, toys – the list goes on. But when the connected device is used in the medical world, it falls under IoT-Medical Devices. One popular definition includes “… a network of sensors, actuators, and other mobile communication devices used in concert with medical devices to improve patient care.” While it is unique in that it influences patient care, IoT-MD nevertheless fits within the definition of the much larger world of IoT. At Syncro Medical, we have been developing embedded products for years that are now called “IoT”. It’s impossible to comment on IoT without at least acknowledging that its very definition is somewhat variable. By some standards, an IoT device must be connected to the Internet, or at least have its own IP address. By others, any wearable or implantable embedded device that exchanges data is IoT, regardless of the communication model. Some definitions suggest an actual Internet connection, some don’t. IoT-MD, being inside the overall scope of IoT, is subject to the same ambiguity. Talk about IoT-MD and all the futuristic ideas start to flow – the cardiac assist device that tracks and uploads a daily record of heart rate changes. The “wearable” used by a winter rescue team that keeps track of body temperature and alerts the home station if a dangerous health condition exists. Or the Epinephrine injector used in case of pending anaphylaxis which calls 911 when used. Is it Dr. “Bones” McCoy’s Tricorder? Well, no – but you can almost see it from here. At Syncro Medical, we recently completed a project where a “pocket” personal medical device reports data to the patient’s mobile phone using BLE (Bluetooth Low Energy). From the phone app, data moved through the Internet to cloud storage. Is this IoT? By some definitions, no – there is no IP communication on the device itself. But the data movement ultimately relies on the Internet, so by the broader definition, yes, it is. For our purposes, at Syncro Medical we consider IoT-MD to include all data enabled embedded medical devices that communicate to some remote point of management, data processing, storage or presentation. a small, low-power device is used either in or on the body to sense and/or control. Let’s call it the “sensor/controller”. It’s capable of wireless communication (almost exclusively BLE). the s/c communicates to a more powerful device that is close by – almost always a mobile phone app. This app may be simply for data storage/forwarding or may be used to guide the patient or manage sensing and control functions. the mobile phone communicates through the Internet to a cloud-based storage system. This may be simply for data archival purposes, or may provide a data portal for the physician to remotely assess the patient’s condition or progress. Less commonly, a pathway exists for the physician to modify the settings on the s/c by using a physician app, through the cloud, through the mobile app, and to the device itself. While this opens the door for more robust product functionality, it also exposes a higher degree of risk related to security. If the physician can remotely change device settings, possibly a hacker can do the same. This 3-stage data architecture, while not exclusive, is quite common in the IoT Medical Device projects we see at Syncro Medical. So, what’s happening out there that’s continuing to fuel IoT? Besides the ever-expanding world of medical technology, there are some pretty cool processors. Processors continue to become more capable and use less power. CPU processing power compared to power consumption is typically measured by microamps per megahertz (µA/Mhz). Not many years ago the state of the art µA/Mhz was hanging around 200. In a few short years we entered the sub-100 range and now, even lower. That fitness tracker on your wrist? It likely has a processor capable of 35 µA/Mhz. To give you an idea of how low this power consumption is, imagine a small device, perhaps an implantable, that can run in excess of 10 years on a single battery. These tiny processors run at 50-100Mhz, several orders of magnitude slower than a typical desktop CPU. But for driving sensors and outputs and supporting communications they are more than adequate. In Syncro Medical’s early embedded days, we used single core processors that got the job done at 2Mhz! Or think about it this way – the low power ARM processor is about 1,000x the speed of the processor that landed Apollo 11 on the moon. That ran about 45 kilohertz – yes, kilohertz! Because many of today’s IoT-MD designs rely on a BLE connection to a smartphone, the BLE chipset becomes critical. Today’s modern BLE chipsets such as those from Nordic and STM use a model called “SoC”, or “System-on-a-Chip”. This defines a single chip that has all the necessary elements for a needed system. The BLE SoC chips offer a general purpose programmable environment that allows a developer to create a specific application without needing another processor. Nordic’s NRF52832, for example, offers 512kB of flash memory and 64kB of RAM. It runs at 64Mhz and only needs 30 microamps per megahertz when running from RAM. All this – plus a BLE environment fully onboard. Developers will find a range of development tools such as the Keil uVision IDE which provides access to a slew of libraries and is optimized for C/C++. These enabling technologies and tools are super-charging the world of IoT. But a super low power CPU, while clearly a future direction, is not a requirement for all IoT-MD needs. Single Board Computers such as Arduino and Raspberry Pi have been used for many IoT applications. The darling of the hobbyist, the Arduino family of SBCs, is a common starting point for many IoT projects. But with no actual OS, and limited memory and CPU, it’s easy to max one out. The RPi, by contrast, can run several flavors of Linux. This allows the user to leverage existing tools for display and communication, and there are tons of available libraries – it’s Linux, after all. This brings us to software. IoT-MD can take on a lot of forms and for some, a dedicated single thread may get the job done. But the more we move uphill in requirements for I/O, storage and multi-threading, the closer we get to needing an actual OS such as Linux. But imagine you are a full Microsoft shop. Your legacy code is written using Visual Studio and your developers are pros with Microsoft Tools. Linux could be a tough sell. One possible solution is Windows 10 IoT Core from Microsoft. Is this the last word on IoT development? Not exactly, but here is what Microsoft brings to the table: A nicely packaged environment that can use existing Microsoft development models, especially for devices requiring a GUI. What if your device has no GUI, you ask? Yes, IoT Core can run headless, but then it becomes less distinct from a single-threaded or Linux-hosted device and at a higher hardware cost. Where IoT Core really shines is in its ability to allow Windows developers to build apps using familiar tools and constructs and deploy them on an embedded device, while leveraging existing code sets. It’s like a grown-up version of Windows Embedded that runs on ever smaller platforms. Recently a Syncro Medical IoT project required a runtime environment for a small SBC and the needs were met quite well by Windows 10 Core IoT. In this related blog, we discuss our engineering team’s experience getting IoT Core up and running, including the pros and cons. So, what’s beyond today’s IoT Medical Devices? We can count on faster, smaller processors that will open up doors for applications not yet imagined. More mature software solutions will emerge. Of course, you will need mature IoT software and systems development expertise. That’s where Syncro Medical has been setting the standard for nearly 30 years. 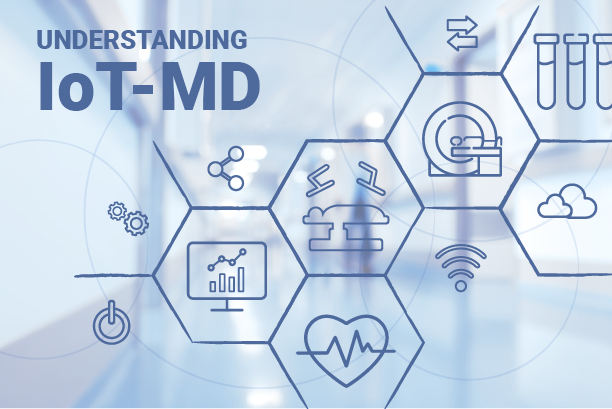 Are you considering IoT-MD for your next-generation medical products? Syncro Medical will help you understand the available options, and provide cost-effective full-cycle development. Dale Van Aken is Founder and Chairman of Syncro Medical, a technology company serving medical product manufacturers. In roles as an engineer, manager and consultant, Dale accumulated a wide range of expertise in successful product development. Through that experience, Dale developed a business model that Syncro still employs. It operates at the intersection of domestic outsourcing and high quality expertise, and does so with a strong emphasis on relationships. He has carefully built and trained a leadership team and has continually refined the approach now used by Syncro to ensure quality in both the client relationship and the resulting product. Outside of Syncro, Dale is active in local and international charities. A father of four, he enjoys cycling and woodworking and is involved in community sports and music programs. He has been twice recognized by Inc. magazine as an Inc. 500 CEO.